Mechanicsburg, Pa. — The Delaware River Port Authority (DRPA) selected Modjeski and Masters for the 2018 Biennial Inspection of the Benjamin Franklin Bridge. This historic structure features a 1,750-foot main suspended span and is over 9,500 feet in total length. 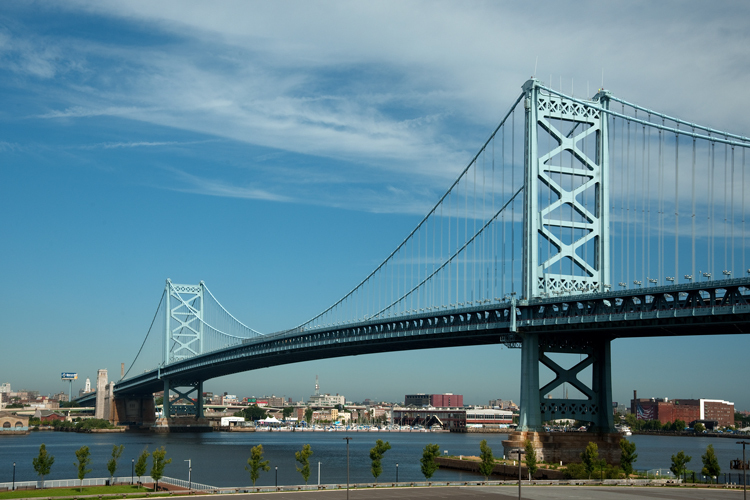 As the prime consultant for this contract, Modjeski and Masters will perform a close visual hands-on inspection of the Benjamin Franklin Bridge facility in 2018. The goal is to update the condition of all fracture-critical members and fatigue-sensitive evaluations. Modjeski and Masters will also write a bridge-specific load rating manual for the bridge, as well as perform a subsequent load rating on the bridge according to that manual. For more information on Modjeski and Masters work on this and other suspension bridges, visit: http://www.modjeski.com/projects/search-results.aspx?service=Suspension#basic.